There is one main difference between homes with city water and homes with well water. In the homes with city water, the water is tested and regulated by the EPA (Environmental Protection Agency). This means that your water is tested and treated for contaminants before it gets to you. There is a chance for contamination to occur once it leaves the treatment plant, but the water has been treated. With a well, these events do not take place. Your water isn’t tested or treated unless the owner of the property does those things. Luckily, the best well water test kits test for a variety of common and some not some common contaminants to make sure you and your family are safe when it comes to the water in your home. Even though the EPA doesn’t regulate well water, they do offer information about the importance of using well water testing kits in order to learn more about what is in your water. For example, water run-off that occurs when snow melts or rain falls can possibly contaminate wells by sending microorganisms into the well. These microorganisms could be bacteria, parasites, or even a virus that could lead to infections and gastrointestinal distress. Other things to look for include nitrate and nitrite, lead and other heavy metals, organic chemicals, and radioactive contaminants. The best well water test kits check for all of these things and more. More importantly, the results of the test will allow you a clear picture of what’s in your water so you can improve the quality and ensure that your well water isn’t going to cause you any harm. If you want to do some preliminary instant testing that can be done right from your home, the Safe Home Starter system is one of the best well water testing kits you’ll find. 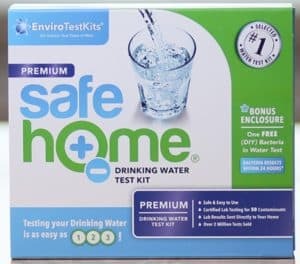 In fact, with over three million of these tests sold, it has proved to be Safe Home’s top selling well water testing kit. Of course, this kit will test more than well water. It can find the 20 contaminants it tests for in well and city water. It also can be used for instant testing on camping trips or trips abroad, as it will also work on lakes, rivers, and other bodies of water. This test is made in the USA and your instant results can be confirmed by an EPA certified lab, if necessary. During your testing, should you find any contaminants that are at a high level, you will be given extra testing options. You will be able to find out if any of these substances are in your water immediately, but also have the protection for further testing, if you find unsettling results. This specific Safe Home Starter test looks for 20 contaminants. Among them, this well water testing kit will seek out dissolved solids, nitrate and nitrite, pesticides, and sulfate. It will also test for bacteria, copper, iron, lead, and mercury. These are just a few of the contaminants that will be tested for in your water. As this is an instant test, you’ll have the results within minutes. Click here to learn more. 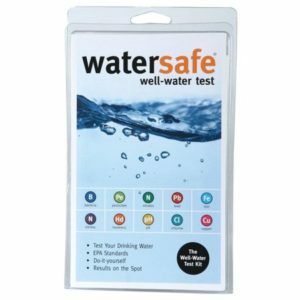 Despite being one of the least expensive options on this list, the WaterSafe Test Kit is one of the best well water test kits when it comes to getting immediate results. All results are compared to the current EPA recommendations, so your water would be held to the same standards used when city water is tested. This is an instant test, so you won’t have to send anything out to a lab. Results will come in moments after you begin your test. Each WaterSafe Test Kit tests for a variety of common contaminants. Chlorine levels will be checked, along with levels of nitrates and nitrites. This test will also look for bacteria, pesticides, and toxins that could come from other areas, like fertilizer. Ten other contaminants are tested for and these include iron, copper, and lead. You’ll even have a chance to determine how hard your water is. As it is recommended that you test your water yearly, if not more, the WaterSafe Test Kit gives you a chance to do so without spending a lot of money. If the test comes up clear, you should be good until the next test. If not, you may need further testing involving a lab. Each kit includes a testing vial for bacteria, a test strip that looks for lead and pesticides, and additional single strips for nitrate and nitrite testing, pH and a hardness indication, and two more test strips – one covering copper and another for iron. Click here to learn more. 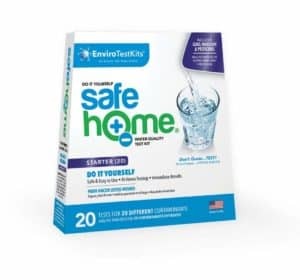 The Safe Home Premium Test Kit is our luxury pick for the best well water test kits because you will receive laboratory results about your water. Not only that, it’s a simple process and all lab fees are included in your purchase. This kit tests for 50 contaminants, which should cover anything common and a few uncommon contaminants. On the downside, the results are not instant. However, your results will come from a lab that uses the same standards set by the EPA, within two weeks of sending them in. The process for collecting your water sample and sending it in is simple. Everything you need to accomplish your test is in the box. You’ll have a set of test vials and a mailer to send the vials to the lab. Just get your sample, put them in the package, and send them off. Your work is done and you’re free to relax. Your results will be emailed to you, usually within ten business days or sooner. As previously mentioned, the Safe Home Premium Test Kit will look for 50 contaminants. Some of the most important contaminants include chloride, nitrate and nitrite, dissolved solids, hardness, bromide, and pH. It will also look for various metals including arsenic, lead, zinc, copper, selenium, and sodium. All in all, your Safe Home Premium Test Kit will check for six in-organic compounds, 12 physical properties, and over 30 toxic metals. Click here to learn more. According to the Center for Disease Control, you should check your well water each year to ensure that the well has no mechanical issues and that the water is free of bacteria and other contaminants. Unlike city water, the EPA does not regulate private water systems. This means that unless you check the quality of your private well, no one will. In many ways it’s more important to test your well water, because without those annual tests, there would be no concrete way of knowing what is in your water. Health & Safety – Contaminated water can lead to all sorts of health problems. In rare cases it could also lead to death. There is no reason to be forced to ingest chemicals and contaminants that are known carcinogens or that cause some other sort of physical ailment. Water testing ensures that all of the bad things in your water are noticed. This gives you the chance to have your water treated properly before exposure from the contaminants in your water becomes too great to ignore. The best way to minimize damage of any sort is to catch it as soon as possible and a home well water test kit will allow you to do that. Water Quality – Clean water tastes better in most cases. Depending on the quality of water in your area, you may notice that your water has a particular smell or that it even tastes funny. That often has something to do with the metals or contaminants that are presently in the water. The best well water test kits check for all kinds of dangers and this includes everything from bacteria to hard water. Once you learn what is in your water, you can treat it and the result will be better tasting water that you can trust is as safe as possible. Peace of Mind – As no government entity regulates well water, the job falls to the homeowner. You should be more interested than anyone though, as your well only provides your family with water. As water is such a necessary part of our lives, it will likely provide a sense of relief knowing that it is safe to use and drink. With all of the things that can harm children and adults alike, it’s worth the small cost to schedule regular testing. Are you interested in our process for choosing the best well water test kits? If you are, here are some of the things we did and looked for in order to make our picks. First, we made sure to test as many products as possible during our research. We also considered price, risk-free guarantee options, and well water test kit reviews along with our personal findings. The result of our research is the above list of the best well water test kits. First-hand Testing – Before we chose any well water testing kits, we wanted to be sure that we knew how they worked and what they were capable of offering. 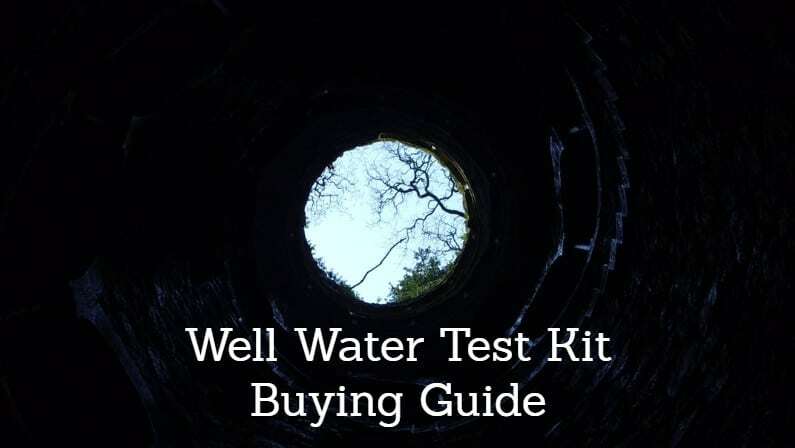 As a result, we spent many hours researching and testing as many test kits as we could find to determine the best well water test kits for this list. In addition to testing, we considered product information, brand reputation, and the benefits and limitations of each kit. Well water test kit reviews – Having our own opinion based on our research is important, but it’s also important to see what others think about certain products based on their specific experiences. With that in mind, we took into account many well water test kit reviews to get a better idea of how each well water testing kit performed in a variety of situations. Value – While you cannot put a price on the safety of your family, we wanted to be sure that every well water testing kit we mentioned offered a fair price for the product being offered. This meant finding kits that tested for the most contaminants possible. We attempted to focus on products that were willing to back up their claims with risk-free guarantees, and that had a reputation that people could trust. We wanted to offer the best well water test kits that also give you the most value, no matter what their cost. Looking for test kits better suited for city water? Check out our guide to the best well water testing kits. Don’t like what you see in your test results? You may be interested in a water filter for well water.